Please read the following before submitting your tree. 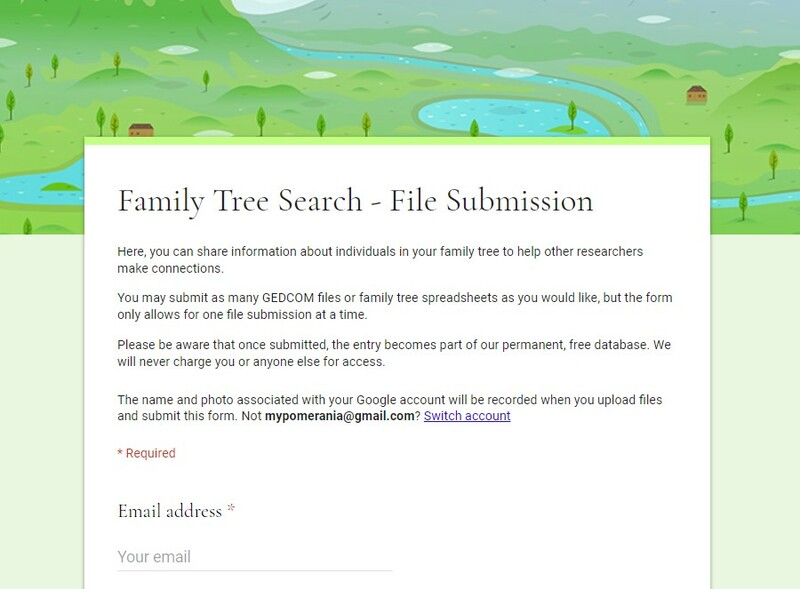 If you have a GEDCOM file or a spreadsheet with several individuals or more, you may submit your information using our family tree submission form. We prefer receiving GEDCOM files, as this allows us to easily import the information into our database. However, we are able to bring in smaller family trees from group sheets or hand-written forms. 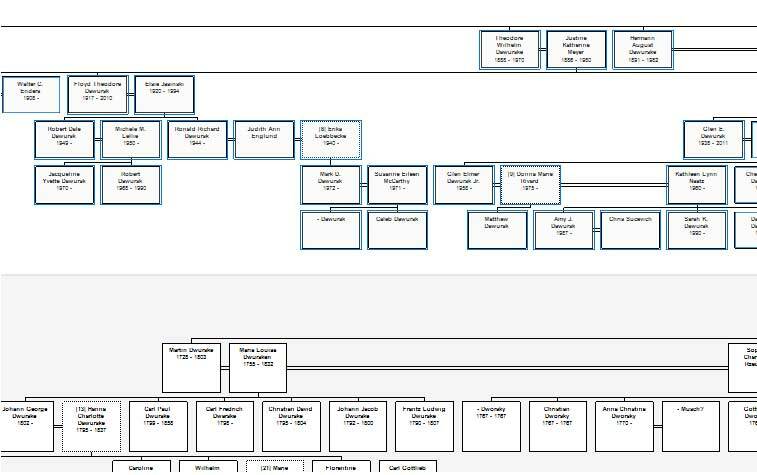 For your convenience, you may download our family tree group sheet to easily and quickly add as many individuals to the database as you would like. Just be sure to upload it using the submission form mentioned above! Please make sure that all place names are standardized, living individuals either removed or privatized, and that the bulk of the tree is related to Pommern. We do not mind having a few additional parents to show where individuals came from, but 99% of your tree should be ancestors or descendants from Pommern. We will also accept individuals from East and West Prussia, Neumark, Posen, Silesia, and Brandenburg, as those were neighboring regions. The information below is provided to give you a walk-through of necessary steps before submitting a GEDCOM if you have never done it before. No one wants to make a mistake and lose years of research. Always work with a copy when editing your file for submissions. If you are using a GEDCOM, you will want to copy the file in its directory and paste it. That will give you a second copy to work with. The best practice is to rename it so you don’t confuse the two files. Please notice the file above is not a GEDCOM. This creates a problem. 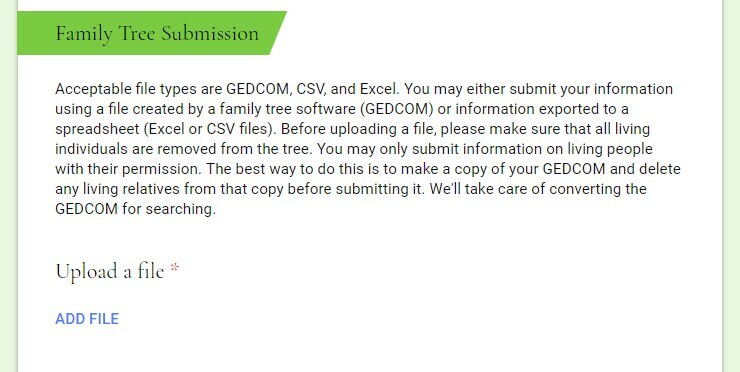 If your file is any other type than GEDCOM, you will want to see the section below about exporting your tree as a GEDCOM. 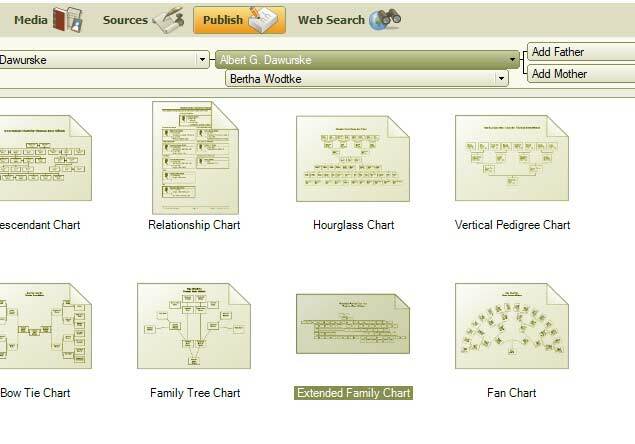 This includes files native to Family Tree Maker, Roots Magic, Legacy, and others–they must be converted to a GEDCOM before they can be uploaded to us. Your GEDCOM file should only contain the branches of your Pomeranian family. 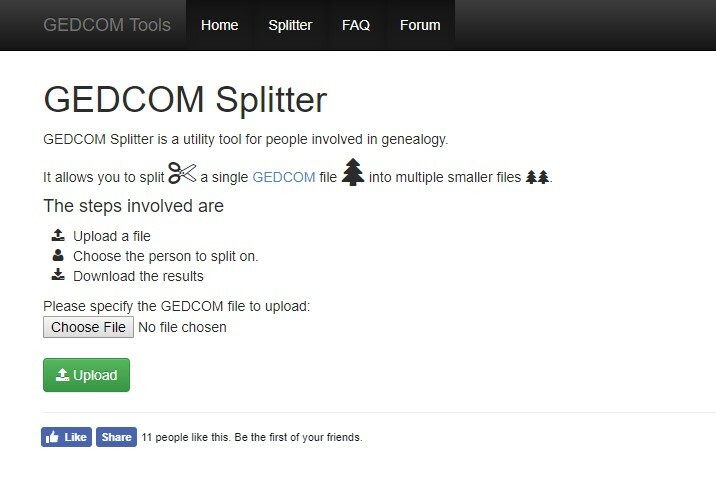 To split off large sections of your tree, you can use GEDCOM Splitter to divide your tree into multiple segments. You may need to run it through the splitter several times to filter out subsequent descendant generations, as full branches of in-law families are retained. 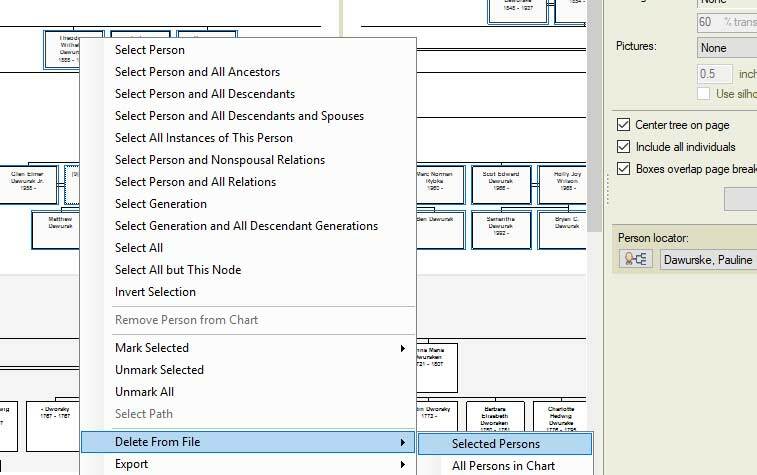 This tool typically helps narrow down the results to a more manageable level for weeding out a few stragglers within your family tree maker software. 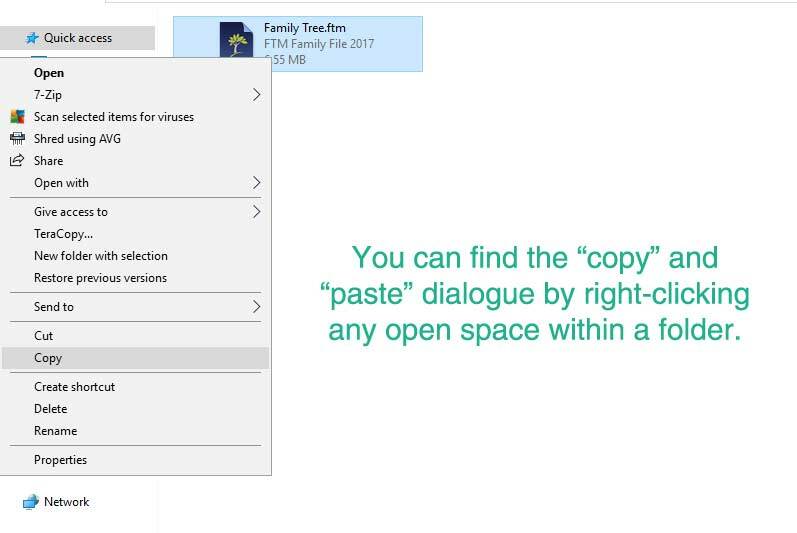 If you own Family Tree Maker, keep reading for detailed instructions. 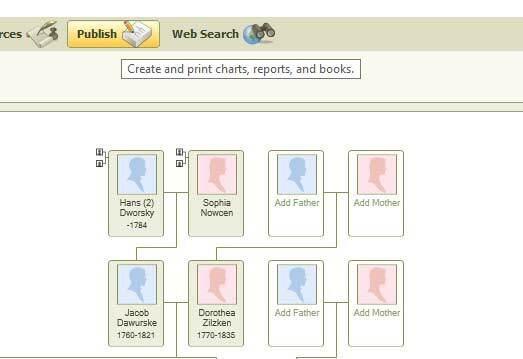 If you have Family Tree Maker, this can be a lot easier. By using the “Publish” tab, you can manually remove people or whole branches from your tree. You will see a pop-up box that asks who you want to detach the person from. That is your decision, but this works best if you completely remove the connection from the rest of the tree for people you do not want to include in your submission. That leaves the child on his own tree. From here, you can delete the whole branch using the steps below. However, you can also do the inverse, and keep this branch and delete the other. It’s your choice. Make sure the box “Include All Individuals” is checked. Regenerate the chart if it doesn’t refresh itself automatically. Select any person in the chart and right-click on him or her. 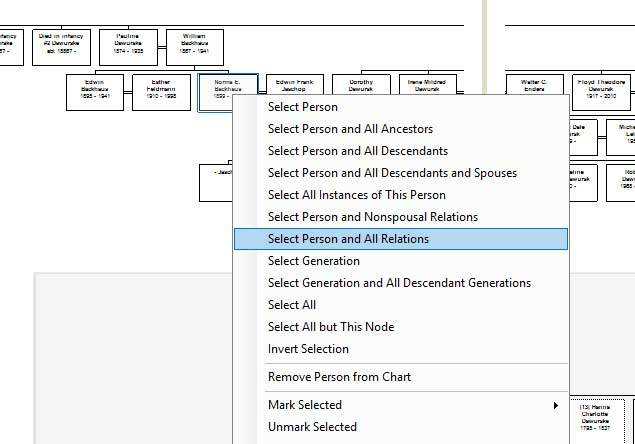 You will click on the “Select Person and All Relations” option. Notice that this selects all persons from the spliced tree but leaves the rest of your tree alone. The next screen will prompt you to choose which individuals to delete. Click the “OK” button to delete all of them. Your file is now purged of people you did not want to include. Congratulations! You can repeat this step as many times as necessary to remove disconnected branches from your tree. Fine tune the file by removing anyone who has no relevance to Pommern. Spouses are fine to include. However, including the spouse’s 5th great-grandparents is not the best idea. You can manually remove them one at a time. 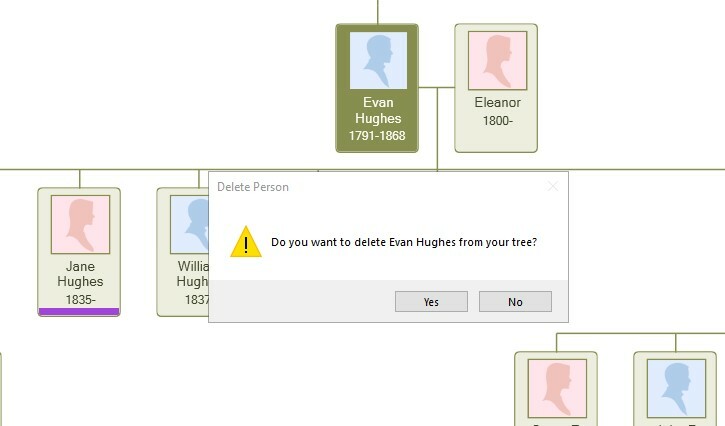 For larger trees, if you are using Family Tree Maker, you can delete them from the “Extended Family Tree Chart.” By selecting an individual, you can delete the person from the tree by clicking “Delete from File” using the method described above. 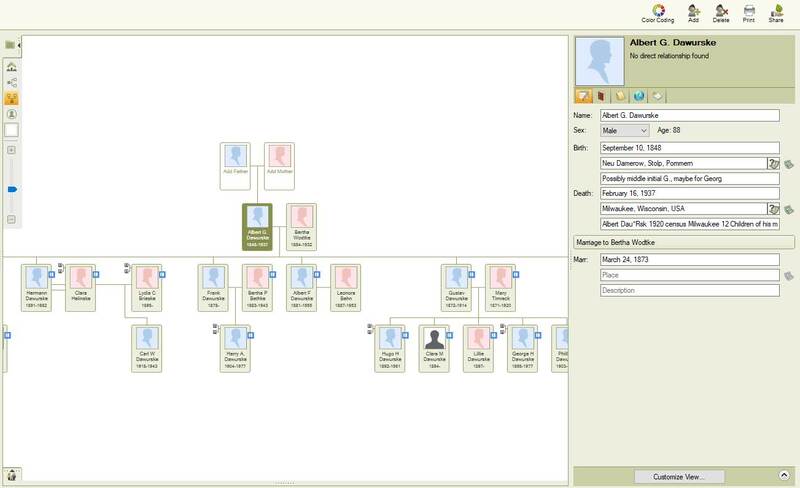 For more advanced users, you can cull out irrelevant family members by querying a branch and deleting all people in the chart. While we do not agree with the GDPR, we do take steps in respect to foreign privacy laws. Rather than marking them as “Private,” which can create a headache for larger trees, please remove them from your GEDCOM file completely. Please note that some software can mark all living individuals as private during a GEDCOM export. This will privatize people who died hundreds of years ago if no birth or death dates have been entered–you do not want to do this. Good golly, this one is a pain for us! 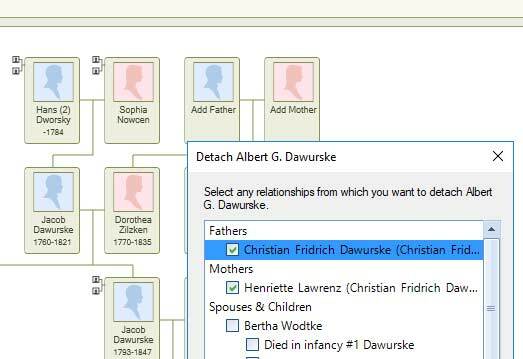 Please make sure the places in your family tree are formatted correctly. There are many different ways of doing this, as each family tree program handles this differently. 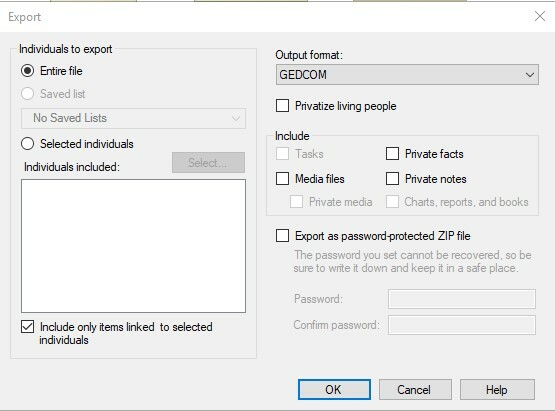 When exporting, no matter what program you use, the file must be in GEDCOM format. Locate the submission form for sending us your GEDCOM file. We use Google for uploading the family tree. 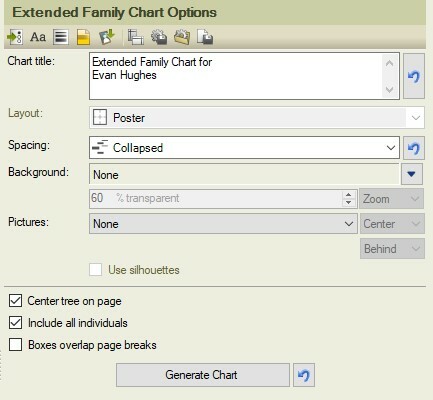 The best way to submit any changes to your tree is to send a list of what is added or changed using the family tree spreadsheet to easily and quickly add as many individuals to the database as you would like. Just be sure to upload it using the submission form mentioned above! 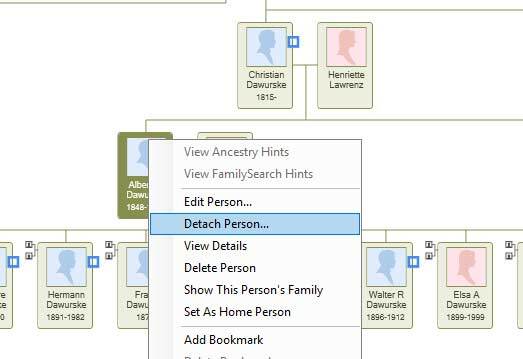 If you are an advanced genealogist, please inquire about registering for an account to make these changes yourself. If you get stuck somewhere in the process, email us at chris@mypomerania.com. We’ll do our best to field your inquiry.